The western region of Kenya is not a traditional dairy production area, although having significant resources that can support dairying. One of the challenges that hinder farmers’ entry into this profitable industry is the use of local breeds of cattle with low productivity. Additionally, in most cases cattle in smallholder settings are predominantly ‘multi-functional’ used for various purposes such as pulling ploughs. 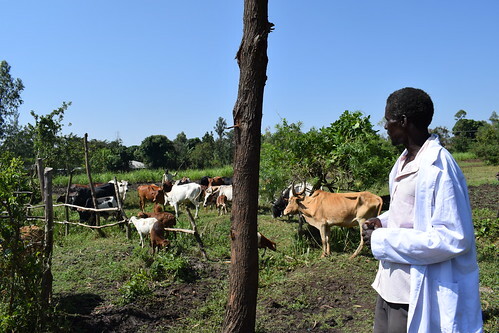 While most farmers in this region would like to engage in productive dairy farming and gain competitive advantage, they are not able to access improved high productive breeds of cattle. This is mostly due to the associated high costs of obtaining a improved breed and the delicate nature of improved breeds (high vulnerability to animal diseases). Since its inception at the start of 2016, the dairy component of the Feed the Future Kenya Accelerated Value Chain Development (AVCD) program has provided opportunities for more households in western Kenya to tap into the lucrative dairy products market in Kenya. Through the International Livestock Research Institute (ILRI), AVCD is promoting accelerated breeding in smallholder farming systems through fixed-time artificial insemination (FTAI).FTAI technology involves synchronizing the reproductive cycles of clusters of animals through hormone therapy followed by mass artificial insemination. 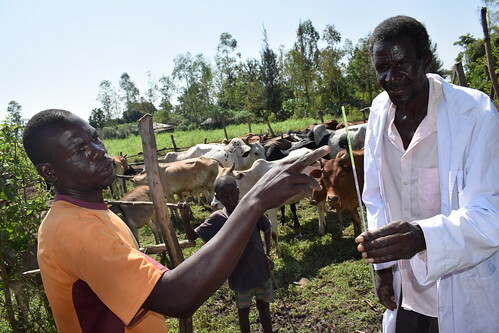 By targeting a large number of animals for oestrus synchronization, particularly cows of indigenous breeds, the technology ensures that large sets of households adopt improved dairy cows and enter the lucrative dairy value chain. While artificial insemination has been around for a long time, not many livestock farmers in the region have been using the service. The low demand for AI services is a result of a scarcity of improved dairy cows, which kept the cost of the service high for the few farmers interested in it and kept the profit margins low for the service providers. This technology will provide the much needed motivation for farmers to venture into dairy production in western Kenya. Am James Wandera, an animal health student at Kenyatta university. I like the AVCD program and I have participated personally on sensitizing farmers. I hope and majority of farmers hope AVCD program will be there for a long period of time until they get the second generation calves.